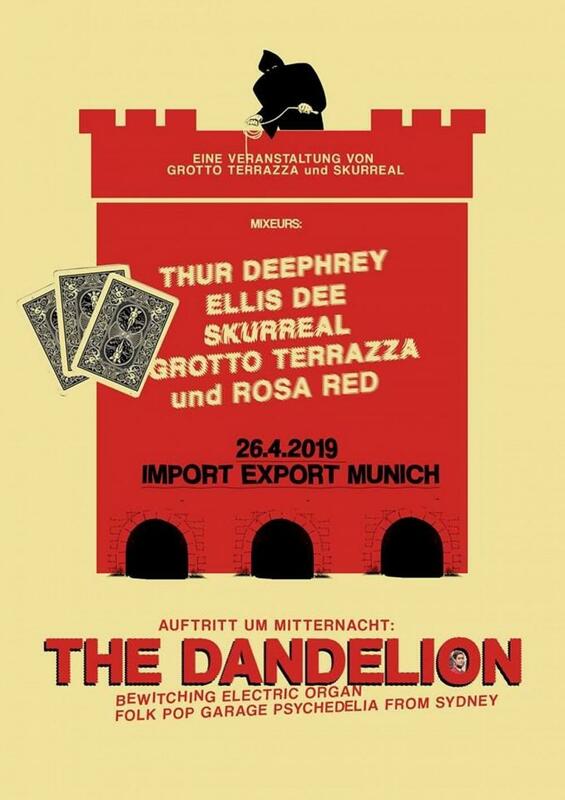 und um Mitternacht spielt die australische Garage Orgel 60s Pop Psych Sensation The Dandelion. We are proud to present Sydney’s most bewitching act: With a sound like seeds turning into flowers The Dandelion bring gifts for the Goddess of magical powers. What started as a studio project evolved into a live band led by Natalie de Silver who writes, records and produces the band’s original material. The Dandelion’s 2nd LP titled 'Seeds Flowers and Magical Powers of The Dandelion' caught the ears of many listeners around the globe, many of whom catapulting it to their favorite album of 2015. In 2017 Natalie begun working on a third album titled 'Old Habits & New Ways of The Dandelion' coming in 2019. The Dandelion joined the Gizzfest 2017, curated by Australian favorites King Gizzard and the Lizard Wizard. With special pre- and aftershow psychedelic mixes by Rosa Red, Grotto Terrazza, Ellis Dee, Thur Deephrey & SKURREAL. The band plays at MIDNIGHT.